While it was often the source of jokes Winston Churchill said the country needed to realise "all it owes to these devoted men". Thousands of people from throughout the generations have gathered at special events across the country marking the 70th anniversary of VE Day. Among the towns and cities honouring the occasion was Exmouth, which suffered heavy casualties when it was targeted by German bombers during the war. ITV News correspondent Nina Nannar was there to meet some of the surviving 'Precious Few' as they paid tribute to their fallen comrades. 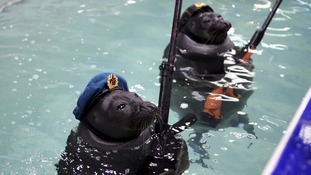 An aquatic park in the Russian Siberian town of Irkutsk marked VE Day by staging a patriotic-themed show, giving two of their seals rifles. The Red Arrows were on hand for a fly past this afternoon, as numerous veterans went on parade before and Prince Charles and the Duchess of Cornwall. The parade, of more than 1,000 veterans and current soldiers, commemorates the 70th anniversary of the end of the Second World War. A parade of over 2,000 Second World War veterans and current soldiers is making its way through Parliament Square and up Whitehall this afternoon, in front of crowds celebrating the 70th anniversary of VE Day. Crowds have gathered in Parliament Square to watch a special parade to mark the 70th anniversary of VE Day. The Royal Family have arrived at Westminster Abbey for this morning's service of thanksgiving for the 70th anniversary of VE Day. Newly re-elected Prime Minister David Cameron and his wife Samantha have arrived at Westminster Abbey for a special service to mark the 70th anniversary of VE Day. David Cameron and his wife Samantha arrive for the Service of Thanksgiving.